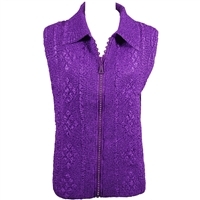 This piece is a lightweight, colorful, flattering and versatile. These chiffon vests will be a great addition to any outfit. Variety of prints and colors available. One size fit. Polyester chiffon. Hand or machine gentle cycle, machine dry low.